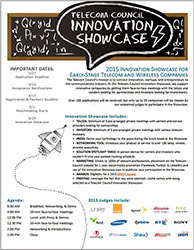 The Telecom Council's annual Innovation Showcase introduces our Service Providers and Investor Forum members to early-stage fixed and wireless telecom innovation. The Showcase companies are selected by a panel of operator and vendor member judges ensuring that they are ideal potential partners and investments for our members. The Showcase offers the opportunity for our Telecom Council Service Provider and Investor Forum members to connect with the 20 Showcaser companies, regardless of their busy schedules. Attendees can drop in for an hour lunch to join fellow telcos, investors, vendors, and press to eat, networking, and meet the Showcasers at their demo tables. Those attendees who are looking to have deeper conversations with the Showcasers can request to participate in the Matchmaker Meetings before and after lunch. These meetings are 10 minute, face-to-face conversations that are scheduled prior to the Showcase using the Telecom Council's online networking tool. Attendees can schedule their Matchmaker Meetings with the Showcasers from May 1st up until the Showcase date. Organizations, such as incubators or venture funds, can introduce their early-stage companies to the executive innovation scouts in attendance at the Showcase by sponsoring a pavilion where their companies can demo and network. See all the details about this and other sponsorship options on the Sponsor Tab. The Telecom Council only opens its doors to press a few times per year, so do not miss out on this opportunity to meet the young innovation that is driving today's telecom industry forward. Press are invited to join us for the lunch portion of the Showcase only. with carriers/service providers looking for partnerships. meetings with serious telecom investors. lunch break at the Showcase. publicize your participation in the Showcase. • Awards: Eligibility for a 2015 SPIFFY Award.